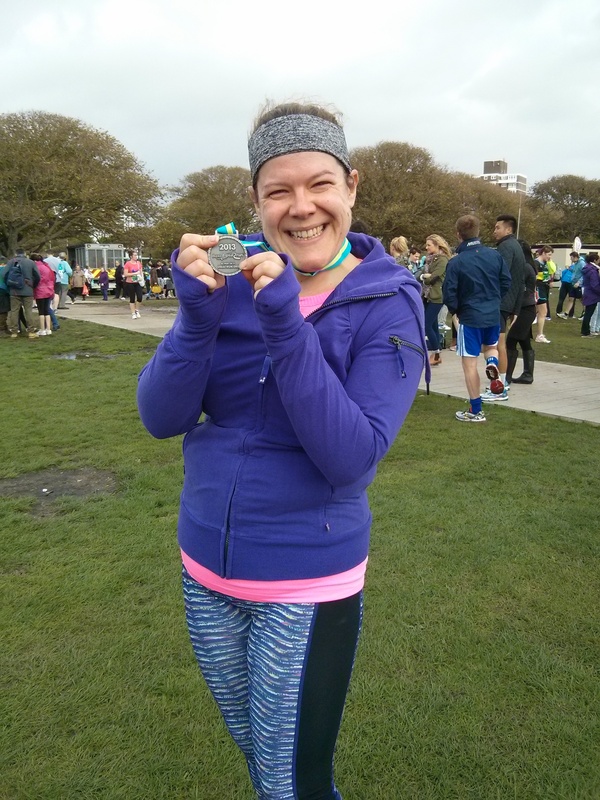 How I got faster at running by not doing very much running…. On Sunday I completed the Great South Run in an incredibly windy Portsmouth in a new personal best time of 1:52:37. The full on headwind in the last two miles slowed me down to what felt like a crawl and stole at least a minute per mile off my pace. In the right conditions I know I would have been even quicker. So, that’s a personal best time set at every distance I’ve raced over this year. And yet I’ve done a lot less running than I did last year and taken part in far fewer races. So what’s made the difference for me? 2) Strength training. This has been absolutely key. Thanks to finding Julia Buckley’s The Fat Burn Revolution: Boost Your Metabolism and Burn Fat Fast I now workout with weights at least twice and sometimes 3 times a week. And they are ‘proper’ weights that really challenge me – I work to failure and push my body outside of its comfort zone. My body has rewarded my efforts with really rather strong legs. 3) Interval training. Last year I did most of my running at the same, steady pace. This year all that has changed. Out with most of the plodding sessions and in with some short, intense interval sessions. They make my lungs feel like I’m going to explode but have done my fitness no end of good. 4) Core strength. Through Julia’s workouts and regular sessions at Tempo Pilates my core strength has dramatically improved. My record for holding a plank currently stands at 3 and a half minutes. Underneath the layer of fat that remains I am convinced there is a six pack just waiting to make an appearance! All these things added together are what’s improved my running. Not lots of long slow runs, in fact they have barely featured in my training this year. And when I do schedule in a long run then I’m actually enjoying them far more than I did last year when they were a weekly slog, most of the time to be endured. I intend to take my new approach to training into my London marathon training when I start in earnest towards the end of the year. I’m going to have to increase the proportion of my training time that I spend running for sure, but I have no intention to going back to ‘just running’. For me this year has proved that to become a better runner I need to do more than run. It’s so worth it though. And actually quite a lot of fun, I think anyway! Good read! I need to do all four of those points. Inspirational! Keep it up, the sky’s the limit! Hard work, yes I guess so. But fun and rewarding at the same time. Thanks. Well done, you’ve had a great year for PB’s. I can definitely identify with the comments on core strength. After a bad (read painful) half last autumn it was something I knew I’d have to work on for the marathon this year. I did some but not quite enough as I found out at mile 23! Have been planning the next two months training based on really improving this before Marathon training starts at Christmas. Thanks! Core strength definitely makes a difference. Do you know what you’re planning on doing in terms of training? You’re in East London aren’t you? If so I’d definitely recommend trying out a session at Tempo Pilates and seeing what you think. They are great classes and really good all round for better running I think. That is great. You tried some new thingsm and theyworked! I went with the massive mileage this year, about 550 miles for my marathon. As I continue my recovery I am making plans for next year. I will include lower body strength training, core work and even upper body work. I also need to do some interval work. I hate it but everyone swears by it. Yeah my lungs always scream at me during intervals but they’re getting stronger for it. I think all over strength training is really important – after all your arms and back can really help with good running form. That’s a lot of miles to cover in your training – hope it paid off? Hi, The miles did pay off. I PR’d at my marathon by 13 minutes. Even with some walking and a lot of pain during the last six miles. I was hoping to run a BQ time but that will have to wait until next year. I’m going to take the next few weeks off. I’ll run 5K Tuesday nights with my club and that is it. My body needs recovery time. I did run a 5K today. A friend of mine was the race director, and I took it easy. Still not the best recovery technique! Look at those Olympic track runners. Talk about fit all over! You are right! Hello. I just wanted to know if you were to rank the 4 areas you listed for most benefit, which order would you put them in? That’s an interesting question and I’m not sure I can rank them because they’re all related. The strength work has contributed to my fat loss as have the intervals. If I had to start somewhere it would probably be with the weights. True that! Great advice and congrats on a year of PBs. That is amazing! Thanks. It feels pretty great. Well done Becca. What a year! You are spot on about long slow runs. They are great training if you want to race long and slow! I did a half marathon recently and in training only did a few longish runs, the longest being 8 miles. I focused on tempo running over 4-5 miles and ended up with a PB. Good luck with VLM training. When do you start? Thanks Peter, it has indeed been quite a year. We’re off on holiday soon so I’ll start ramping up the VLM training once we’re back in December. I feel like everything I’m doing at the moment is part of the preparation for the race though really. But the running will need to increase in a month or so. What’s up next for you after your triathlon triumphs this year? I’m definitely going to include parkrun in my marathon training plan. Hills are great too – I don’t have too many of them nearby but it’s something I could do with incorporating into my training. Which marathon are you doing? And yes, it’s fantastic to see and feel the progress. Running has never been easy for me but it’s starting to feel more comfortable. Yeah Parkrun is great. I’m not sure I’d be able to do a fast Parkrun and then long run on Sundays though so gonna see how it goes once I get stuck in. I’m doing Brighton marathon, and am battling equal measures of fear and excitement. Need to get my knees and ankles looked at by a physio before I start training as don’t wanna get injured. This is fascinating! Thanks for sharing these tips. Love this blog – I’m learning so much!